5.05pm - I'm back from work, I've stocked up on snacks, and I am excited about live-blogging throughout election night. If you're going to be staying up (or, indeed, if you inhabit a different timezone and are just regularly up) I hope you enjoy my rambling thoughts, and I would encourage you to join in! You can get in touch with me via the 'contact' email address above, or on Twitter @colinjthomas, and I will no doubt give you a mention. You wouldn't believe how much padding this thing will need. Either way, keep refreshing this page - I don't know how to do auto-refresh - for regular updates throughout the night. Check out my entries from May 2010 & May 2015 to see what it's going to be like. Or don't bother, if you don't want all my 'jokes' to be spoiled in advance (there's only so much election night material I have). Right, I'm going to sleep for a bit now, and I'll be back raring to go in a few hours. 9.13pm - Right, let's ease ourselves into this. I've got my traditional election-night curry (Tandoori garlic chilli chicken. Very nice), and I'm watching Channel 4's Alternative Election Night - at the moment it's a (pre-recorded, I assume) election-special episode of 8 Out of 10 Cats Does Countdown. Don't worry, I'll be watching the BBC most of the time - with the occasional forays into ITV, and its strong line-up of Ed Balls, George Osborne & my brother's friend Lorna - but since Channel 4 kicks off their coverage 55 minutes earlier than everyone else, what's a guy to do? So far this Countdown thing doesn't seem very election-specialish. Apart from a joke about hung parliaments. Oh! And there's a Countdown polling booth. 9.31 pm - Mmm... lovely curry. Now's as good a time as any to nail my colours to the mast in terms of predictions (NB: all my political predictions have been wrong for the last few years) - I'm going for a Tory majority of 40-60 seats. In fact, if the majority turns out to be less than 60, I have to buy my good friend Ben a takeaway (and vice versa if it's a >60 majority). So I've got a lot riding on this. By the way, I'm horribly out of practice at Countdown, it seems - particularly the numbers. Must try harder. 9.41pm - And while I'm filling time before the big exit poll (Tim Vine joke: "Exit polls? They're on the way out"), let's get the political leanings out of the way now. I voted Conservative. I'm not that excited about it. And I'm no fan of Corbyn. But while this is obviously going to be a subjective night of blogging, I'm not going to get too party-political - Paddy Ashdown eating hats, Richard Osman's unfeasibly large hair & David Dimbleby not understanding what Twitter is: that's my jam. (Also, I got the Countdown numbers game right this time. Progress). Oh, and my social media game might have peaked already: five people have liked my observation that the guy on 8 Out Of 10 Cats is astonishingly unfunny. 9.54pm - I managed about ten seconds of Jeremy Paxman before switching over to DIY SOS on the BBC. And then 'Car Crash Britain' on ITV - it appears to be a knock-off of You've Been Framed. Wonderful stuff. There's a bird making a noise when a guy's trying to film something. You couldn't make it up. 10.01pm - Unbelievable! The exit poll says what YouGov have been saying for a week - the Conservatives are on track to have lost seats, and fallen short of an overall majority. We've had the first reference to "If These Numbers Are Correct" (ITNAC) just seconds after the graph, and neither Dimbleby nor Kuenssberg - don't worry, I'll check how to spell that name later - seem to have much confidence in the figures. But the exit polls have been pretty decent in the last couple of elections. "Sensational" says Jeremy Vine in a virtual House of Commons. I've been to the real House of Commons. The virtual one is nicer. 10.08pm - Michael Fallon is first up to parrot the line that we need to wait for actual results, and this is just an exit poll, you know. Very early. Projection. It's going to be an unilluminating first couple of hours. More surprisingly, John McDonnell (a nasty piece of work, if you ask me) agrees with Fallon, and isn't getting carried away yet. I'm surprised he hasn't ordered champagne, to be honest. Does Deliveroo deliver to BBC studios? Does Deliveroo deliver champagne? Come on, Dimbledby, ask the questions that the nation wants to hear. Oh, and if people are keeping count, we've had the first "magic money tree" reference... I suspect Conservative HQ are ripping up "strong and stable" memos as I type. 10.14pm - The BBC are projecting their exit poll on the outside of Broadcasting House. Weirdly, the single Green seat was the only on that got a cheer. The 22 seat drop for SNP is going to get more focus as the night wears on, I imagine: obviously they nabbed almost all the Scottish seats last time round so there wasn't much scope for improvement, but losing 40% of their seats would be a pretty damning verdict. Elsewhere, first fun Dimbleby moment of the night: "We join the other main party leader, Nick Robinson..." No, it's not an unexpected job swap, just an awkward sentence construction. Nick's in Islington, stalking Corbyn. 10.19pm - "You might recognise the face of Gavin Barwell". Oh, come on. Seriously? If you're reading this, and you're not James Lee, please let me know if you recognised the face of Gavin Barwell. Thanks to those of you who have got in touch so far on Twitter - Ben tells me he's feeling confident (rightly so), Simon confirms that this exit poll is astonishing (yes), John says the UK may as well fall on its sword (hmmm) and Dave - in advance of the exit poll, in fairness - has given me takeaway recommendations (lamb pathia? Can't see it, myself). I've even got Bob - not the most frequent user of social media - liking one of my tweets. What a night. 10.29pm - I've had a quick flick over to ITV, which always seems to be louder than the BBC. Robert Peston is rambling on unchecked. At least, the anchor chappie is trying to interrupt, and utterly failing - "I just want to say one more thing", Peston says, before saying what sounds like several more things. But I'm pleased to report that ITNAC is as popular on ITV as it is on BBC. Over on Channel 4 they've got people who, I think, are from Googlebox. "Why isn't Jeremy Corbyn there?" they're asking. Not sure where. I'm going back to the Beeb. Michael Fallon is trying to claim that the General Election was actually the right thing to do, in order to strengthen Theresa May's hand in Brexit negotiations, and is sticking firmly to the fact that no results have been declared yet. It makes a change to see Tories in fervent denial: they're the Lib Dems of 2017. 10.36pm - A positive note for Conservative fans: their projected seat number is 314, which approximates to 100 x pi. Dimbleby is in full back-pedalling mode: "I'll assume nothing!" he cries, & "Are we going to be hung, drawn & quartered if this is all wrong! "; he's also keen to point out that the poll was jointly commissioned by BBC, ITV & Sky, so they'll all be together in having egg on their face (or not). I'm an old hand at this, now, so I know that exit polls are actually - despite what everyone is saying - 100% watertight and guaranteed to be spot on. Take it from me, "40-60 seat majority" guy. In local news, Bristol North West is coming up as a Labour gain according to the exit poll, which would be as surprising as anything in this mad election. Poor Charlotte Leslie. 10.45pm - Broken promises, as usual: Sunderland South is now not due to declare until 11pm, following an initial estimate of 10.45pm. I'm outraged. Dimbleby - in what will be his last hurrah, unless Theresa May fancies trying another election next year - is clearly enjoying himself, despite the stench of lies from the North-East. Investors are gamblers, apparently. Over on ITV Michael Gove is looking a bit defensive, but - in perhaps the least surprising comment of the evening thus far - thinks that Theresa (first name terms, it seems, despite the way she booted him out) should stay on as Prime Minister. Also - I think we might have a new winner for least surprising comment of the evening thus far - he doesn't think we should have a second Brexit referendum. Now they've moved on to someone in the ITV computer hub (my name for it: I don't think they called it that), where Tweets per second (Tps, presumably) are up 30% compared to 2015. Hold the front page. Also, "Google is where you search for things". Hard to work out what target market ITV is aiming for. 10.48pm - Matthew Parris is putting his neck on the line. Whereas everyone else is caveating all their responses with a bit of ITNAC, Parris says that they're not going to be crazily wrong: it's a dismal night for the Tories, and he's not afraid to say so. And he reckons there will be another election this year. Stick with him, ITV, you're getting TV gold (I mean, he's a Times columnist, of course he's good). BBC can keep McDonnell, Fallon & some bloke from the SNP; ITV will always have Parris. Right, I'm going to go and make a cup of tea. 10.57pm - "Jeremy, are you ready?" It's all very friendly in Dimbleby's world, with no hurrying required. Jeremy Vine is in the VRHoC (Virtual Reality House of Commons) and, for some reason, rather than colouring the seats in the parties' colours, we've got stacks in the middle of the floor heading towards a dotted line. What a ridiculous waste... but wait! The seats are being coloured even now, but it's all gone wrong and the seats have been coloured on just one side (the right side, if that can be taken as an indication of anything - BBC's famous anti-Corbyn bias, perhaps? ), with parties overlapping each other. Someone's getting fired. "I won't bother putting the Lib... OK, let's put the Lib Dems in" says Jeremy. Clearly the seven weeks he's had to prepare for his time in the virtual limelight has not been enough. Over in Lisburn, DUP chappy wants Brexit to work. "You're keeping something up your sleeve from our viewers" Dimbleby alleges. The DUP chap - John - says he isn't going to reveal his hand. I think he needs to get his sleeves shortened. 11.08pm - "Wales is weird" says the man on ITV, who is apparently Welsh and so can get away with it. For some reason the ITV anchor - I'll learn his name at some point - is letting him talk over the fact that, in a truly historic event, Newcastle Central has become the first seat to declare: a devastating night for Sunderland South. Even Jermaine Defoe couldn't save them. Obviously it's a Labour win - it always is - but more interestingly it's a 10% rise in Labour vote but only a 2.1% swing from Tory to Labour. Peter Kellner - "elections expert" - is very excited, because the exit poll had it down as a 7% swing, so perhaps the Labour vote has been overstated...? No, says John Curtice (Professor of Politics; possessor of suspiciously unkempt hair, but only on the right side of his head; minor internet celebrity), this is actually all to do with Brexit. I didn't exactly follow why that was the case. But who cares, because Sunderland South are declaring, with a microphone that's as dodgy as their paper-running strategy must have been. The Lib Dem chap has got 908 votes and is about 12 years old. Labour have won, of course, but now the graphics have stopped updating and the whole thing is going to pot. 11.26pm - I'm told that the 'contact' link above might not work, so if you want to get in touch via email please give election@colinjthomas.co.uk a try. People who have been in contact include Andy, who was apparently heading to bed about an hour ago, and Mum, whose (possible unique) take is that May wanted to lose the election in order to make someone else take on Brexit negotiations. Also, John - my former colleague - is considering relinquishing his support of Newcastle United, based on their Labour vote. Sadly Wolverhampton's three constituencies were all Labour in 2015, so I've not been able to persuade him to switch to the gold & black. Elsewhere, Jack Straw has brought out the "weak and wobbly" line, and has got the name of his own shadow home secretary wrong ("John McDonald"). John Curtice says that he doesn't want to bore us, and then said something that was so boring that I can't remember what it was. 11.38pm - My first sight of George Osborne tonight, and he's piling on Theresa May. Anyone casting even a casual eye over his Evening Standard coverage recently will know that he's gone all guns blazing on her leadership, so it's no surprise that he's revelling a bit. Looking quite, well, statesmanlike, dare I say it. Worth a leadership challenge...? And then we're back into the ITV Computer Hub™, where Nina - see, I told you I'd find out her name - has found a comfy sofa with, as luck would have it, a Guardian columnist on it. He's got some slightly reluctantly kind things to say about Corbyn, and I have to say he's not the only one who's had to eat his words. Is it too late to delete all my comments & posts about how Corbyn = wipeout? 11.49pm - David Blunkett is congratulating Corbyn. Young scallywag Owen Jones, who has bobbed back and forth on Corbyn in the past, is looking rather sombre and is (his words) "showing humility". He's keen to be allowed to talk on for a while - "because David got quite a long bit, there" - and Tom Bradby is letting him. Bradby really doesn't have Dimbleby's authority, even if the latter is clearly past his best. Anyways, Owen Jones seems absolutely outraged by the idea that winning the election could ever have been an ambition for Corbyn, and is taking Bradby to task with his suggestion that losing the election could be portrayed as losing. Oh! And now we have someone called Colin. I think he's ITV's Peter Kellner - but clearly better, because his name is Colin. We've got our third declared seat, and again it's a swing to the Conservatives. Puzzling stuff. Elsewhere, Emily Thornberry is calling for Theresa May's resignation - after a raft of resignations in the morning following the 2015 General Election, it'll be interesting to see if she does throw the towel in. I'd say not, and I'm always wrong. But I'm going to stick my neck out and say Farage will be back as UKIP leader. 12.01am - Dimbleby asks Kellner if Sheffield students have gone home or not yet. Kellner does the classic "I don't know, ask someone else" face. Over in Newcastle East, Nick Brown has won the seat for Labour and again it's with a swing to the Conservatives, something that Dimbleby has described as a good result for the Tories, despite the fact that they lost by 20,000 votes. Nick Brown is, perhaps, most famous for being a correct - and pointless - answer on the TV show Pointless when the competitors just made up his name as a guess. Well, he might be more famous for being Labour whip. Anyway, Dimbleby has turned very grumpy - it is, in fairness, five hours past his bed time - due to the poor sound quality in the North East ("It's supposed to be 2017, not... 19... 17. Absurd") and the fly in the studio that has apparently evaded capture for three days. "It's all to play for, which I refuse to say" he says. "It's mid night. Midnight" he says. I could fill this whole blog with the wavering utterances of the Dimble. And, since it's midnight, we have the news telling us exactly the same thing that we've already been told for the last two hours. 12.14am - Paddy Hatsdown (this pun was good enough to get me a mention on the BBC site in 2015) hasn't appeared on my TV at all, but has tweeted: "If the exit polls are right Britain is more polarised than ever in my life time. REALLY time now for the centre to get its act together." Yep. Now Emily Thornberry is on the BBC screen, doing her one-woman Theresa-May-Must-Resign tour of London. The fact that she's the only high profile person saying this suggests, to me, that it's Labour sending her out to test the water; she's also made the bold claim that Labour could be forming the next government. Dimbleby wants to know if she's saying that Jeremy Corbyn will "kiss hands with the Queen, or whatever he agrees to do with the Queen", which adds an unexpected frisson to events. Ken Clarke has now joined the party from Nottingham and expects a Tory majority, but doesn't think we'll know until 4am at the earliest. I suspect it will be a lot later than that, Ken. 12.31am - Sounds like gunshots in the ITV studio. No one seems to care, though, so I imagine it's just someone bumping into something, or possibly the sound of a carelessly removed microphone. Andy Coulson is there - presumably out on good behaviour - as is Stanley Johnson, whose son BoJo is apparently odds on favourite to be next leader of the Conservatives. Surely not. StaJo is making the utterly ludicrous claim that this isn't a bad night for the Tories, and in fact the key thing we can take from the results is that people want more environmental concerns to be raised in Brexit negotiations. Didn't see that one coming. A quick flick over to Channel 4, and Anne Widdecombe is unhappy about the prospect of a hung parliament. Alastair Campbell looks really, really unhappy about being stuck on Channel 4. Maybe he's heard that Coulson got ITV. Barry Gardiner is on the big screen, isn't particularly happy with Paxman's coverage - he's likened it to a Strictly Come Dancing audition, which I'm pretty sure isn't a thing - and there's about a six second lag before all his responses. Also, someone - possibly Barry - appears to have the radio on. Over to Michael Crick in Islington, with the exciting exclusive that "Mr Corbyn" had been turned away from the count because he didn't have his ID. Big news. Turns out that it wasn't Jeremy, though, it was his son. Small news. 12.42am - Dimbleby update: he's said "overdue" (several times) when he meant "undue", while talking to Liam Fox who - by the by - is sporting a rather lovely blue tie. Now he's got Emily Maitlis's name wrong. And he seems absolutely baffled by the fact that the BBC coverage is going out live on Twitter. Poor chap. Anyway, Nuneaton is a Conservative hold (0.2% swing to Labour), as is Broxbourne (2.2% swing to Tory). Laura K - I think I did spell her surname correctly before, and I'm not risking another try - has speculated there might be a new post-referendum map. Somebody tell Jeremy Vine's graphics man! 12.48am - I'll be honest, thinking about it, I'm also a bit confused about how the BBC coverage is going out on Twitter. But it's a fun election over there, where Simon, Darren, Bob, James (whom I've tangled up in a thread of people he doesn't know), Martin and more are still going strong. At least some of them are planning on going to work tomorrow, I believe. On the BBC, Danny Finkelstein - Times columnist, and my favourite journalist - is joining the throngs admitting they were wrong about Corbyn, and is being repeatedly interrupted by fellow panellist Andrew Rawnsley of the Guardian - a left-wing insurgence? 12.58am - George Osborne is now jumping up and down on Theresa May with complete and utter glee: the party wouldn't want her fighting another election; she wrote the manifesto almost single-handedly and it was a disaster; it was the worst manifesto ever from a governing party. Osborne can't really think he'll be PM, can he? But this might be his ticket back to the cabinet. A "Tory source rather close to Boris Johnson" - i.e. Boris Johnson - has said that people needed hope. Another source suggests he's sounding out colleagues regarding his leadership hopes. Did the last 11 months or so actually happen? Back in the ITVCH, people are searching "Why are the Conservatives called Tories? ", hopefully settling once and for all the biggest question of the evening. 1.03am - There's a woman on Channel 4 whose hair looks really heavy. So heavy it seems to be dragging her head over. I wish I had more hair. 1.15am - "We're all waking up to this" says Tom Bradby. I've not spent much time on ITV - it really is very loud - but presumably he's not been nodding off between interviews, has he? There's a recount in Amber Rudd's Hastings & Rye seat, apparently, which I'm sure she didn't see coming when the night started. Any chance she can persuade Theresa May to take her place this time? Over on Channel 4, Richard Osman and David Mitchell are both getting lots of laughs and almost making up for Paxman. Someone's said that nothing is nailed to the ship. I have no idea what that means. I'm no mariner: I grew up in the Midlands, a considerable distance from the coast. North of the border, there's a big result in Rutherglen & Hamilton West (you know what they say about R&HW) where the SNP have narrowly lost their seat to Labour. John Curtice is growing smugger by the second, as the exit poll is looking pretty decent. 1.37am - Jeremy Paxman is making a big thing of Theresa May not having turned up at her constituency yet. I don't think any of the party leaders have - we haven't had the exciting electoral staple of rolling footage of cars, yet. I'm actually spending more and more time on Channel 4, as the BBC coverage at the moment is pretty dull. And it's all happening on Twitter, where Darren has spotted that Jeremy Corbyn is now favourite to be Prime Minister. Surely, surely not? Deputy Labour leader Tom Watson has won his seat, but the cameras have stopped working so we've got famously impartial Labour peer Shami Chakrabarti instead. Like many others tonight, she's riffing on Jeremy Corbyn's great success - hope over fear, and all that - without seeming to recognise that Labour are on course to have 50 seats fewer than the Tories. I mean, I can't deny that it's a much better result for them than expected... but they still lost, right? 1.50am - Alastair Campbell has been promoted to ITV, but doesn't look much happier than he did on Channel 4. Answering his first question by saying "I honestly don't know" isn't the kind of thing that will get him the BBC gig, though. Putney's a Conservative hold for Justine Greening, despite a 10% swing to Labour, and the returning officer looks like he's in a Terry Pratchett novel - very nifty robes. Are they all wearing that? We've got our first footage of a party leader, Tim Farron walking to his car, and it seems that both his seat and Nick Clegg's are under threat. Could be a surprisingly bad night for the Lib Dems after all. But wait! A big moment - the first appearance of the Swingometer, and it's in virtual Elizabeth Tower (just as it was in 2015)... a swing of 9 seats from Labour to Conservative as it stands. Jeremy Vine is sauntering around, and is now behind a virtual graph that is helpfully labelled "United Kingdom". I knew I recognised that map. 1.58am - Tom Watson, in West Bromwich (boo!) dodges out of shot ("taken from us" - Dimbleby) to allow us to see the count being announced. It's a safe seat, though, so what's the point - we cut back for a few seconds to discussions on Alastair Campbell telling "someone else" (i.e. ITV) that Brexit can't go ahead under the current timetable, before leaping over to Tom Watson again. As a strong opponent to Corbyn, Watson is getting grilled a bit, but coping well. More importantly, this Alastair Campbell discussion must surely mean that the big man will soon be grabbing an Uber over to Broadcasting House? Speaking of which - sort of - does Peter Mandelson still get invited to these things? Last night I dreamt I went to Mandelson again... over in Scotland, the SNP downfall continues with a Conservative win in Angus on a massive 16% swing. 2.07am - Nigel Farage has described UKIP as "pretty weak", although he exempts Paul Nuttall from that criticism because the voters apparently don't know who he is yet. As I predicted - I flippin' got one right! - he's said he would have absolutely no choice but to return to politics in this country in the event that Jeremy Corbyn becomes PM. "Not what I plan. Not what I want", he lies. I reckon he'll be back either way. Oh, and apparently the reason the Tories have done badly in this election is that Theresa May was a Remainer. Give me strength. He and Dimbleby agree that Theresa May is a Vicar of Bray, and I can never remember what that means. Also, I'm not going to bother looking it up. Elsewhere, Labour have taken Battersea with a 10% swing, where the Socialist Party of Great Britain won a massive 32 votes. 2.21am - For local voters, Bob has sent me a link to Bristol Post's exit polls. Be warned, it comes with a video which (on my computer, at least) auto-plays. They look, if I'm honest, phenomenally unlikely: the fact that they show Labour victories in all four Bristol constituencies isn't crazy, but the slashed Green & Lib Dem vote share in Bristol West can't be right. Can it? Anyway, the result from Bristol North West (my constituency) is expected at 3am, according to the Times, which was wildly off in their prediction last time. Over on the BBC, and it really is a bit of a shambles - so many graphics not loading on time, or going missing. I know that it's Dimbleby's schtick, but Huw Edwards must be feeling confident about taking over next time. Yeovil (my parents' constituency) has stayed Tory, which is another bad sign for the Lib Dems but probably reflects the Leave vote in Somerset, and I'm thinking of putting on some thicker socks. 2.32am - We've got a revised forecast, and it's 322 for the Conservatives (compared to 314, you'll remember, in the original exit poll). Looks like the gains will be coming from Scotland - there's been another 16% swing from SNP to Tory in Ochil & South Perthshire. Is that related to Ochilview, home of the mighty Stenhousemuir? Probably. I'm done researching stuff. Labour forecast to be on 261. This is a humiliating night for the Tories, there's no getting away from that, but I'll keep saying it: Labour are on course to be 60 seats behind. These are the kind of results that would have been greeted as an unexpected Tory victory in 2015, and are now seen as a huge failure. Not saying I necessarily disagree with either assessment, given the respective conditions, but there you go. Time for a second cup of tea. 2.47am - ITV have finally got round to using the updated forecast, although in their case they're going with 265 for Labour. It's not impossible I just wrote it down wrong before. George Osborne is looking noticeably deflated - maybe, like me, he's just really tired - and mustbe hoping against hope that Theresa May doesn't sneak to a working majority. Speaking of whom, she's turned up at the count and is walking pretty darn fast past the cameras. ITV have only played the footage once. I can only imagine that the BBC have it on loop and Dimbleby hasn't realised yet. Apparently 'Southampton Test' is a Labour hold. Are they allowed to have trial runs of these things? Huge news from Sheffield Hallam, though, where Nick Clegg has lost his seat - sad to see, he doesn't deserve that. 3.01am - David Davies says that the Tory aim was never to win a massive majority. Silly boy. In Sheffield, Nick Clegg uses his concession speech to call for parties not to amplify their differences, and instead to work together. He's rudely cut off by the BBC, who have moved over to Vince Cable's re-election in Twickenham instead. Tim Farron's having a "bundle recount" in Kendal. Cable for Lib Dem leader? Over on ITV we're getting Boris's acceptance speech in Uxbridge - he's going to work for those who voted for him and, controversially, for those who didn't vote for him. With equal zeal. Which is fortunate, what with there being a secret ballot and all. Tom Bradby follows this with the exciting news that "we've been told" that Vince Cable "appears to have" been elected in Twickenham. Since the count had just been shown on both BBC and Channel 4, this is hardly investigative journalism of the highest order. He's now joined by, among others, outgoing NUS president and noted anti-semite (er... I mean "alleged". But, goodness me, she's awful) Malia Bouattia. 3.13am - All the Bristol results are in, and they're all Labour. And, indeed, the Bristol Post exit polls look like they've turned out pretty accurate - Bristol West, for example, was 65.9% for Thangam Debbonaire (great name) with Green dropping to 12.9% and Lib Dem to 13.8%. Sadly my constituency has fallen to Labour with 50.7% of the vote, against Charlotte Leslie's 41.8%. Sorry to see her go. Over in Islington North, Jeremy Corbyn has won his seat with a huge majority; his friends in the Communist League did take 7 (seven) of the votes, though. He's called for Theresa May to go, and make way for a government that represents everyone in the country. A reminder: her party is on course to win 60 seats more than his. I'm sounding bitter now, aren't I? Forgive me. I'm tired, confused, and a little scared. 3.30am - We're in Maidenhead, where Theresa May's opponents include someone in a giant Elmo costume. He's just picked up 3 votes... and his head. And, oh boy, this is one of those returning officers who breaks down all the reasons for rejecting votes, even into categories where no votes were rejected ("Rejected in part: zero"). She also can't pronounce "Theresa", although she's given it a good go several times. Anyway, the Prime Minister doesn't quite sound like she's planning to resign - the country needs a period of stability if Conservatives do win the most seats, she's said repeatedly - but she's stopped well short of guaranteeing that she'll be leading the government. Wouldn't surprise me if she does step down, once all the votes are in. Nick Robinson thinks she's been crying, for what it's worth. Anyway, Jeremy Vine is back in the VRHoC - now with fully functioning seat-colouring, it seems - and the forecast is down to 318 for Conservative. Or up to 318 for Conservative, depending on what you're measuring against. In good news for fans of repeated digits, Tim Farron has won Westmorland & Lonsdale by just 777 votes. 3.44am - Robert Peston thinks Theresa May will probably step down, and - with George Osborne sitting by, presumably seething - BoJo & David Davies are the only possible candidates to replace her. If you thought this was the most dispiriting general election choice possible... anyways, over in Boston (not the American Boston, Tom Bradby assures us) Paul Nuttall has come a distant third with 7.7% of the vote. It's them sevens again. Coincidence? Or establishment stitch-up? Impossible to say. Over on Channel 4, the energy levels are well down: nothing's getting much of a laugh any more, and I fear the audience is flagging. Maybe they should have bussed in a new lot. There's nothing exciting going on in the BBC studio either. Unexpectedly, ITV looks like the place where I'll be settling for a bit longer: getting Osborne & Balls on the show was a great idea, with the former in particular continuing to perform strongly. And stably. The ITV forecast has the Conservatives on 320, by the way. 3.57am - Jacob Rees-Mogg, possibly my favourite MP, is back in. Yet more errors at the BBC, where the chap in Hastings first doesn't realise that Dimbleby is talking to him, then seems to think he's talking to him off air, then the light goes out for a bit. In the end they make connection and we get confirmation that there's a full recount in Amber Rudd's constituency (something I'm pretty sure other channels were reporting on some time ago). Next up is Nicola Sturgeon, and Dimbleby can't tell her how many seats the SNP have lost so far, because the graphic on his computer has just reset to zero. I have friends at the Beeb so I'll try not to be too critical - after all, it's stupid o'clock and only fools like me are still watching - but I think they'll be disappointed with how this one's going. Certainly doesn't seem as polished as ITV. Still, we've got our first helicopter footage of the Prime Minister's car, which is always exciting. So exciting, in fact, that Chris in Belfast has been moved to half a screen, so that the other half can show the convoy. Looks like the traffic isn't too bad at this time of night. 4.07am - George Osborne says that Labour would have won a majority if they had a more credible leader. I concur. Ed Balls makes the more easily proveable claim that Labour could only have won a majority by winning more seats. I've just realised that George Osborne has more hair than me. That's depressing. Man, I'm tired. Ah, here's Ruth Davidson, one of the few politicans who's had a good 2017, and she's certainly looking chipper. Nice lass. Conservatives have held Brigg & Goole, a constituency that has clearly been made up on the spot to see if anyone is still awake. Wait! There's an exciting graph comparing seats won and lost in the West Midlands... and it's zero for everyone. Fascinating stuff. 4.21am - York Outer has stayed Conservative. I guess they probably voted Leave. Conservatives now have more seats than Labour: 224 vs. 222 according to the BBC; 250 vs. 230 according to ITV. No idea why they've got so many more seats declared; I'd have thought it was pretty clear whether a seat's been won or not, because someone in fancy robes stands up and reads out a whole bunch of numbers. Over on the BBC, JRM says that "Mrs May" will still have the support of the Conservative party; he's a loyal chap, and (possibly this isn't relevant) he's wearing the largest rosette of the night so far. Dimbleby let him go as the set around him was gradually being dismantled - "The day Thou gavest, Lord, is ended" as the Mogg wisely commented. As I'm getting more and more tired, I think my use of tenses is falling to pieces. Oh, Alex Salmond has just lost his seat to someone called Colin James something. Not me. 4.34am - Psephological expert John Curtice is now using the distance between his fingers to demonstrate probability, and hasn't smoothed his hair down despite it having been sticking up for over six hours now. It's clearly an affectation. I've written a lot about hair tonight, I'm realising. Over on Channel 4 the girl with the huge hair thinks that we should wait a little longer before commenting further. Solid idea for content. Winchester's just declared. Did you know that it has the longest cathedral in Europe? Ruth Davidson has moved across to the BBC, looks phenomenally well-rested, is keeping her comments resolutely Scotland-based, and refuses to be drawn on the Theresa May question. Speaking of whom, we've now got footage of her arriving at some building in London - one that Margaret Thatcher waved out of once, or something - and Dimbleby insists on knowing why she's not gone back to Downing Street instead. Also, he wants to know why they're using a helicopter instead of a drone to get their footage. Nobody cares, because Jeremy Vine is now wandering about on a virtual map of Britain, showing the constituencies that have changed... well, most of them haven't, so it's a bit dull. If I'm honest, I've been disappointed by Vine's virtual realities this year - nothing we haven't seen before, and less imaginative than in 2015 (when we had a virtual Cameron & Miliband, among others). 4.44am - Anna Soubry (Conservative) says that Conservatives ran a terrible campaign. Asked to expand upon this, she adds that it was a terrible campaign. Ms Soubry is no fan of Theresa May, it seems, and steadfastly refuses to back her leader: "It's bad" & "She has to consider her position". If you enjoy footage of almost-abandoned leisure centres, this is the time of night to watch TV: Anna Soubry's backdrop is three or four people sloping off home, and a basketball hoop. 4.55am - Iain Duncan Smith has told the BBC that his Conservative colleagues shouldn't go on the media. Curious. Now Chuka Umunna is on the screen, answering a question that Dimbleby absolutely did not ask him. He was one of the many Labour MPs who voted no confidence in Corbyn last year, so he's a bit embarrassed now (aren't we all, Chuka?) and his joy in a large victory must be tempered by the knowledge that this must put an end to his leadership chances for many years, if not forever. Asked if he'd take a role, he says he wouldn't rule out being in a shadow cabinet - interesting that he's still thinking along the lines of a shadow cabinet rather than, you know, a cabinet. Over in Hastings they've finally finished recounting, and Amber Rudd has won by a few hundred votes - she and her Labour counterpart are the only ones still standing for the announcement; I guess everyone else is in bed. Notably, she's not wearing a rosette. No, wait, sorry, that's not notable at all. 5.10am - John Woodcock, who sources (Laura Kuenssberg on Twitter) tell me is probably Corbyn's biggest critic, can barely control his amusement at how events have unfolded tonight. He's kept his seat in Barrow-in-Furness, and doesn't really understand how: "I don't konw what's going on". Elsewhere, ITV's political correspondent (I think) says that the mood in Conservative HQ is "low, low, low". That's a song, isn't it? Tell you what, it's properly daytime now - the sun is streaming in. People are probably getting up early to see how it's all going, I guess. Welcome to my blog, if you're one of those people. Was sleeping fun? It sounds fun. 5.16am - Apparently the battle in North East Fife might have gone down to a single vote! Possibly the first time ever that any voter can legitimately claim their vote actually mattered. Beautiful stuff. Jeremy Vine is back on Downing Street, where I regret to have to inform you there's been no attempt to reflect the fact that the sun has risen: it's still in relative darkness. Cheap. Vine is now telling us that May needs just over 50% in order to win a majority. He's not wrong - that is, indeed, the definition of a majority - but we're over seven hours in and it's a bit late to be covering the basics. 5.31am - Richard Osman - with his TV producer hat on - is plugging a reality TV show to decide who gets to negotiate Brexit, and doesn't mind if a dog wins so long as it's not a German shepherd. As he says, it's twenty past five and he can be forgiven if not all the jokes land. Elsewhere, I'm pleased to announce that Alastair Campbell has finally made it onto the BBC, even if he's stuck next to Paul Mason (a silly man). He thinks May has to go - something that all of ITV's panellists seem to have made their mind up about ages ago, as it goes - and is firm in saying that the Conservatives have lost, rather than Labour having won. On that I absolutely agree. Mason is nodding away, despite being a big supporter of Corbyn. 5.41am - Well, with 29 seats to go it's definitively a hung parliament with the Tories as the largest party. And Jeremy Vine is sitting in fake parliament! What a reveal: previously he was only ever walking in it. The poor chap has had to call for technical assistance with his tablet - "it doesn't matter if we see you" - because he couldn't get it to light up, or something. Some chap with a headset has just become a star. But the news from the VRHoC is that the Tories should be able to form a majority by lumping together with the DUP. More errors in the BBC, where Laura K - who has generally been reliable throughout the night - says that Theresa May has been in power for 330 days ("That sounds wrong"); presumably that's actually the length of time since Cameron resigned. Moving over to ITV, and I've had to enter a PIN because the programme started after 9pm and it's now before 9pm. Hmm. Time is funny, isn't it? 5.46am - I think my average entry length has been too long tonight. Something to think about for next time. This one will pull down the mean, though. 5.54am - Stephen Crabb is in Haverfordwest - a place with a horrendous one-way system, in case you were wondering, but nice B&Bs - and his sound & vision are crazily out of sync. It looks a bit like he's being dubbed. Chaos reigns, as the BBC can see Richmond (where Zac Goldsmith's waiting on a repeated recount) but can't talk to them; an attempt to go to North Fife is immediately aborted; Laura's explanation of how hung parliaments work is then cut off for confirmation - ironically - that it's going to be a hung parliament. I thought it was already confirmed, to be honest, but apparently we needed Southampton to make sure. Some debate, now, as to whether or not May has to go to the palace. Consensus seems to be that she does, and then she can put forward a Queen's speech - presumably one she's found lying around the palace? 6.06am - ITV are almost done, signing off on Ed Balls' prediction that there will be another general election this year. I remember everyone saying something similar when we had the coalition government, though, and that lasted the full term. Channel 4 has finished their coverage as well - I think Countdown is repeating - and David Dimbleby is congratulating returning viewers on not having bothered staying up all night. Danny Finkelstein has just been introduced as being from the Guardian, which indicates that the left-wing surge has spread even more widely than previously thought. Anyway, he's cheerily admitting that he - and I, although he hasn't specifically mentioned me by name - was completely wrong about Corbyn's ability to pick up voters with a hard-left appeal. I guess it's not too embarrassing being completely wrong, when almost everyone else was as well. What did Michael Gove warn us about experts? 6.10am - Caroline Lucas is doing her victory speech and I'm going to bed. I don't imagine that anyone will have resigned before I wake up. Except maybe the ComRes people. Good night, it's been a blast. You'll remember that, back on April 17th, I started my list of '40 things to do before 40'. I only got to halfway, though, as it seems there aren't actually that many things that I'm eager to do. But wait! I have more! I've not rounded off the list, but time ticks on - I'm nearly two months closer to 40 than I was when I wrote the first half of the list - so here are the next ten. None of which I've done yet. That would be cheating. 21. Visit Canada - last time I said I wasn't much of a traveller, but I fancy visiting the Great White North. I mean, any country that produces Michael J. Fox and Rachel McAdams must be pretty awesome. Watch this space. 22. See Billy Joel live - I'm not entirely sure the Eagles (number 17 on my list) are actually still touring, but Billy Joel is still going strong. I think. He's written loads of great songs, and I think he'd be good love. 23. Learn how to use chopsticks - it's frankly embarrassing having to ask for a fork whenever I eat Chinese food. Especially that time when I was the only Caucasian in the place. 24. Run in the Bristol 10k - this was definitely in my plans last autumn, the first (and, so far, only) time I ran 10k. Niggling injuries have made me wonder if I'll ever be able to do it again. Maybe? 25. Learn how to poach eggs - Rob and I tried this at Uni. He had a theory that swirling the water round would help push the egg into the centre of the pan. It didn't. It pushed the egg to pieces. My motto was: if at first you don't succeed, just switch back to making omelettes. But I should persevere. (Using an egg poacher is cheating). 26. Learn how to scramble eggs - I really know very little about egg-based cooking. 27. Persuade Simon to give up tea - just for Lent, or something. I'm wearing him down. It's for his own good, you know. If I do everything else on these lists then he'll have to, right? 28. Write a play - I've written a few sketches and performed in a couple of plays. Surely I can combine the two? Well, who knows, but it would be fun to get my teeth stuck into it, and if I get there I'm sure I know some people who would be willing to act it out. 29. Buy curtain tie-backs - if I put it on this list, I might even get round to doing it. 30. Stand for election - technically I've already stood for election as church treasurer (unopposed). I think I'm ready for the wider stage. Any old fool can stand for Bristol mayor, maybe I'll give that a whirl. Just ten more to go. I'm getting there. And, while these lists absolutely have to be personal, I'm perfectly happy to take suggestions on board (and almost certainly reject them out of hand). Also, if anyone wants to help me do any of these things - or, indeed, the things from the previous list (looking forward to our Les Mis trip, Rob!) then please give me a shout. I don't play a lot of sport. This is something of an understatement - I was a fairly regular squash player until a year or two ago, when it all seemed to peter out a bit (speaking of which, Pete, if you read this - which I don't think you do - fancy a game sometime? ), and I run from time to time, but that's about it. Specifically, I never play team sports. Apart from the odd game of beach football on a stag do, that is (yes, I did score a goal on Steve's stag do last year, since you ask. What's that? Was it a tap-in that bounced my way after a lucky deflection? Why, yes, yes it was). So I don't much experience the joys of being part of a team. I mean, I'm part of a team at work, of course. And I guess that can be joyful, especially when someone's brought in cakes. But apart from occasional involvement with project teams - which is one of my favourite parts of the job, in fact - little of my work lends itself to active team collaboration. While getting someone to review your spreadsheet is kinda fun, I suppose, it doesn't really compare with providing the assist for the winning goal. Ask anyone. And that's one of the things I've really enjoyed about acting. Cue picture of some acting. As you'll have read on this page before, I've been getting involved in amateur dramatics for the last couple of years, and last month had the role of Detective Inspector Twigg in a murder mystery comedy (that's me on the left, in the picture that - honestly - makes me look the least bald). There is much to enjoy about acting, but, as I say, one of the best things about it is the teamwork. I'm sure this isn't the case in every drama group, where prima donnas (Italian for 'best kebabs') and backstage in-fighting probably make the whole experience fairly unpleasant. But I've been lucky enough to find myself in a drama group where everyone's looking out for each other, no one's trying to steal the limelight, and we're all there to have fun & put on the best show we can. And that's where the teamwork comes in - because it's so collaborative, we all have to depend on each other to get the scenes to work: building a rapport; teeing up the jokes; even the physicality of making sure we're all in the right place on the stage at the right time. While one or two people might have more lines or more punchlines, the whole thing doesn't work unless we're all working together. We may not be seamless (hey, it's am dram), but all the pieces fit. Actually, it's particularly the mistakes that bring out the teamwork on stage (and, of course, offstage - it's not just about the actors, y'know). When you've realised that someone's missed a line and you need to fill in; when you can't for the life of you remember your line and you're hoping someone can fill the gap; when the prop has gone missing or isn't in the right place. I mean, we don't make that many mistakes, honest. But when we do, someone's there to pick up the slack. Teamwork. Makes the dream work, they say. Also, getting people to laugh at what you're doing is one of the best feelings there is. Well, it is for me. (This is such a luvvie-ish blog post. Sorry. It'll probably get worse from here). In my case I'm sure it derives from deep-seated insecurities and what-have-you, but I always enjoy making people laugh, and that feeling is heightened when it's a whole audience - even if the jokes are scripted for you, in that case. And (reverting to my teamwork theme) it's even more fun when there are two or more of you building the scene and the comedy together. This is probably why I'd never dare to do stand-up comedy, but I'd like to give improv a whirl some day. Ah yes, nerves. I'd be lying if I said that I didn't get nervous before performances, but to be honest I think I get more nervous when I'm meeting a roomful of new people. I'm aware that nervousness means I don't always make the best first impression. In a play, you get months to rehearse your first impression. Ideal. 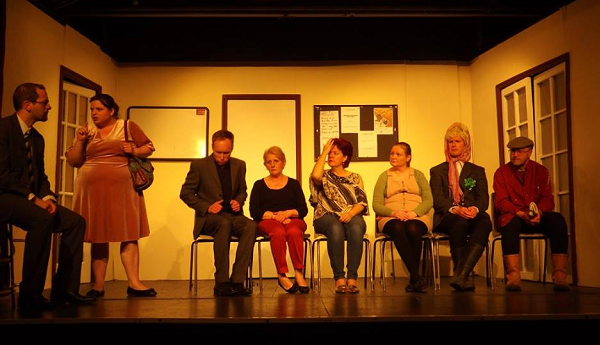 So, if you're thinking about giving amateur dramatics a go, I wholeheartedly endorse it. Find a good team. (And don't worry if you don't think you can act; I'm pretty sure I can't. Just know your lines and don't bump into the furniture).